Owner Paolo Esposito teamed up years ago with Guido D’Onofrio, a renowned Caruso expert, and in the process created a restaurant that is truly unique. Esposito’s admiration for the famous tenor led him to build what is a “museum-restaurant” that counts over 400 artifacts linked to Caruso. 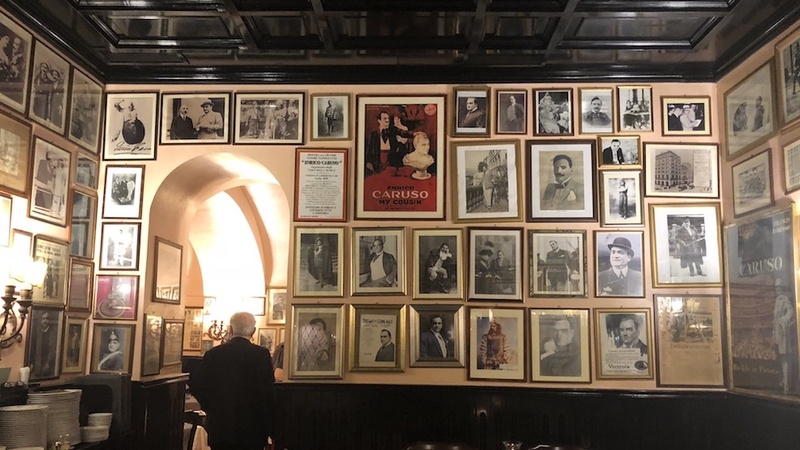 For example, the walls of the restaurant are completely covered in images of the tenor, with numerous postcards, photos, music scrolls and other vintage memorabilia directly related to Caruso. 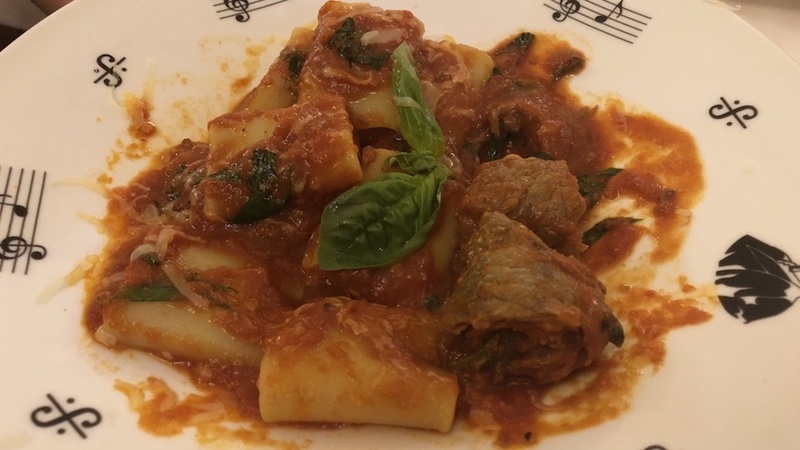 During the year, the restaurant also organizes very popular cultural evenings with many music and lifestyle experts on hand invited to speak and to hear old, hard to find recordings of the tenor and his music. The festive, “days gone by” atmosphere of the place is heightened on weekends and special evenings when a local guitar-playing musician serenades all the tables with songs. Call it cheesy or touristy all you want, but it’s actually a pleasure to hear the man sing and play, and the fact he asks for favorites adds greatly to the fun of the evening. I usually choose Girl from Ipanema or Caruso. 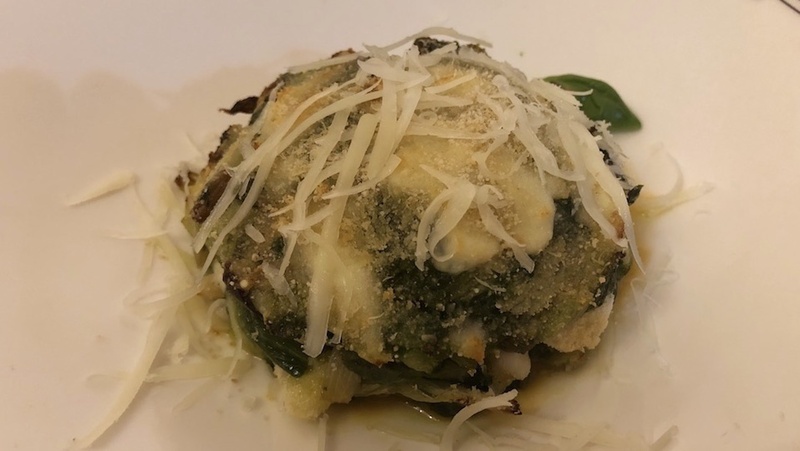 The novel concept and charming, slightly dowdy, interior aside, the Ristorante Museo Caruso would prove less interesting if the restaurant itself wasn’t so terrific. The food and wine list are very, very good. 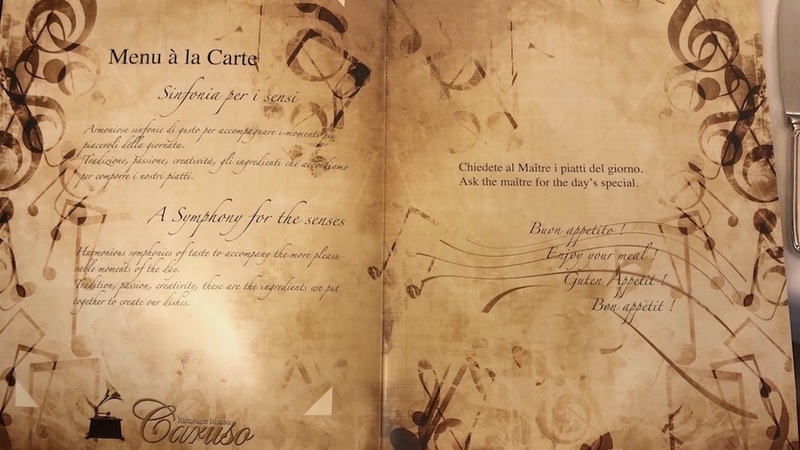 The menu is made up of classic Neapolitan and Campanian coast classics, all nicely rendered. 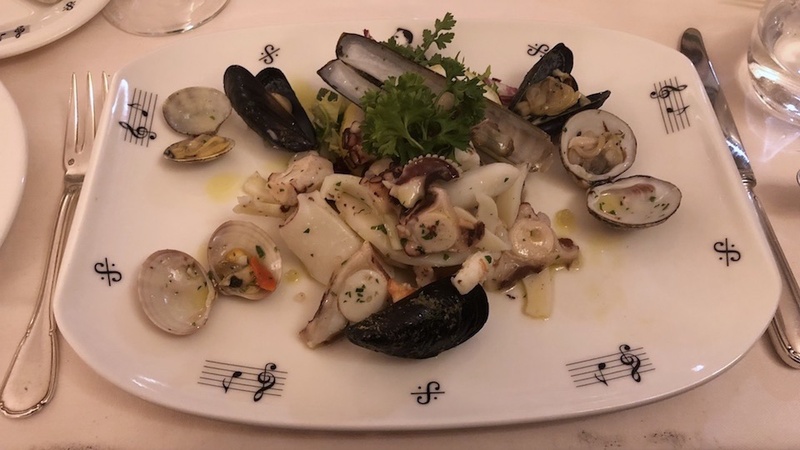 My seafood salad and scents of the coast dish is lovely and fresh, with plenty of flavorful mussels, clams, squid and more. 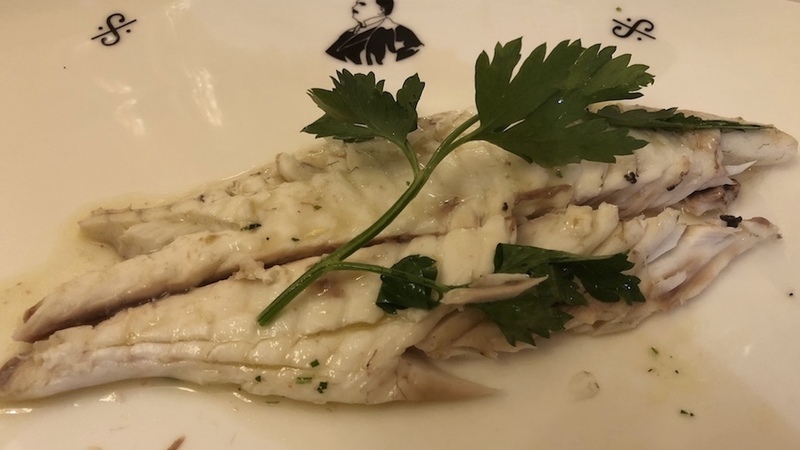 The freshness theme carries through to the “catch of the day” an oven roasted sea bream (orata) that is moist and perfumed, delivering precise, fresh aromas and flavors lifted by just the smallest squeeze of lemon. Even better is the paccheri with tomato ragout of Neapolitan beef chop, a fantastically cooked version of a Neapolitan classic that is impossible to eat anywhere else outside of Naples or Campania (and even in Campania, the slow and very long cooking that is required to make a proper Neapolitan ragout is not in the chords or hearts of many a modern chef). The wine list at Caruso is huge and filled with some of Italy’s and the world’s greatest names. On this night, after a week of drinking practically nothing but Campanian whites and reds, I opt to go French. 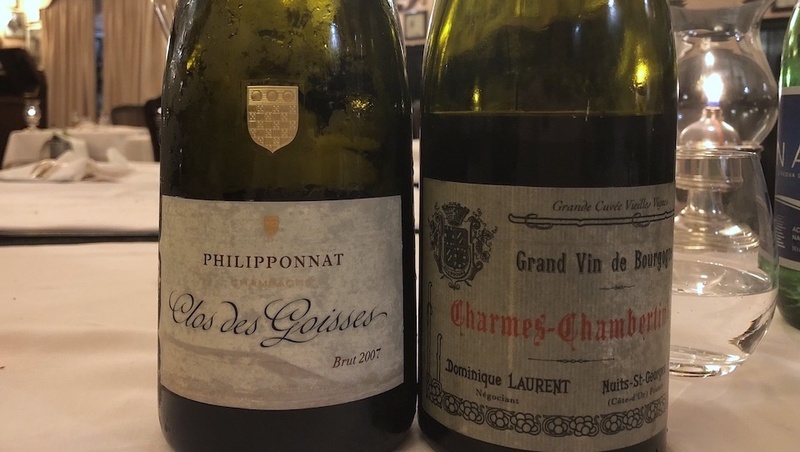 A wine of remarkable finesse rather than power, the 2007 Philipponnat Brut Clos de Goisses boasts laser-like acidity and accuracy of flavor that are memorable. One of my favorite Champagnes, Clos de Goisses is usually a powerful bubbly in its youth, but this 2007 is rather politely-styled, almost delicate in fact, in its white fruit and floral aromas and flavors. Best of all, it is still exceptionally young and will last for decades in a proper cellar. From my favorite Burgundy vintage of the last fifteen years (though there are a few others I like almost as much), the 2005 Charmes-Chambertin from Dominique Laurent is everything this great wine ought to be (a small amount of the grapes used come from old vines in Mazoyères). The wine boasts a lovely red cherry and red berry quality enhanced by a strong mineral underpinning that adds complexity and nuance. Yes, even after thirteen years and counting, Laurent’s penchant for oak is still on display, but the magic of this site and the 2005 vintage have combined to give a wine with enough sultry flesh and roundness to make Rubens proud. A meal at the Ristorante Museo Caruso glides effortlessly by. Though service is extremely professional, it remains friendly, and everyone, patrons and staff alike, seem to be having a good time. The place is a far cry from monastic temples of culinary gastronomy where you can hear a pin drop. Here, starting up a conversation with the people sitting at the table next to yours is almost automatic. In fact, my last time there I found myself singing along with the restaurant’s modern-day troubadour to the notes of the Antônio Carolos Jobim’s classic he was playing softly at my tableside. In fact, the friendly, cozy atmosphere at Caruso is so inviting that almost without realizing it, you kick back and relax. Fortunately, nobody does so in the kitchen or when deciding how to make the wine list even better, and it’s that attention to detail and precision that goes a long way in adding to a fun and unique restaurant evening.